The Ottocanali 8K4 is a flexible and reliable 8-channel power amplifiers with up to a total of 8,000 W at 4?, ideal for multi-zone applications in medium to large-scale installs: Ottocanali 8K4 supports any combination of lo-Z loudspeakers, mono-bridgeable channel pairs and 70V/100V Hi-Z distributed lines with no need for output step-up transformers. 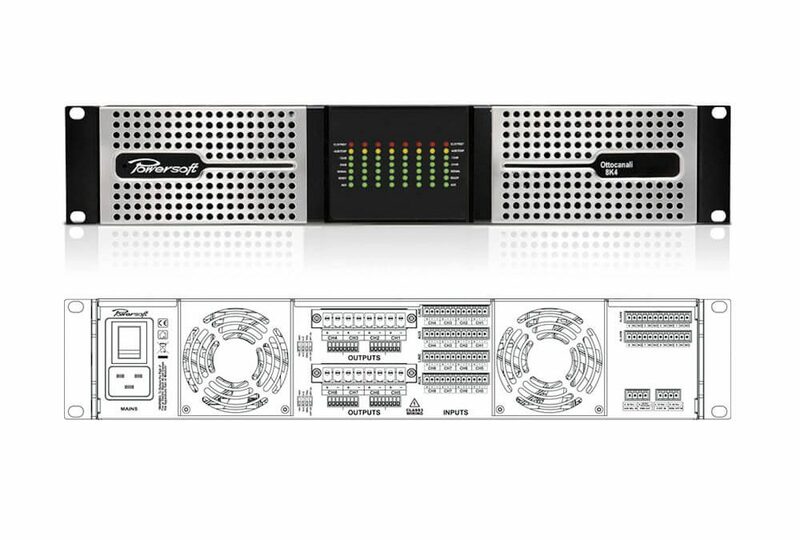 The Ottocanali 8K4 features switchable main/aux signal inputs and offers a wide range of system control, alarms, GPI/O and monitoring functions as well as sound shaping options. New Ottocanali 8K4 DSP+D heralds new and innovative level of signal processing, providing non-boolean routing and mixing, multi-stage equalization with raised-cosine, IIR and FIR filters, delay up to 2 s in input processing and 100 ms for time alignment, gain and polarity adjustment, crossover, peak limiters, TruePower™ limiters and Active DampingControl™.